Hello everybody, I`ve just started to participate one important Sustainable Development project in South Africa. I see passionate real doers who have power to make significant changes in the world. I would like to make introduction how I do my project work and so you can learn something useful for yourself. We all live in complicated world. People who tell you things are easy or offer you to think less typically want you to be deadly dependent from them (or anothers) in making decisions. You could feed them for ages just because they wisely converted all intelligent approachs to own favour. If you are OK with it, let it be. If you want to be effective and efficient in short and long run, and have own ability to make questions and rule projects, just try to check the method I work and train it. From my first high education, it was Physics, and my first passion which was Math I learned how short descriptions can turn the thinking, decisions making and creation processes. The first stage of any successful project is to understand what`s we really have, what`s we want, what`s condition could be added, what`s can be changed. If you are trained in mnemonics you can do it in your ming. But, honestly said, it is enough things to remember today. So it is better to write your ideas. Flat word-by-word writing is not the best tool for it. You could stuck with smallest things, such as the first phrase, and stuck with the style, and other problems. Flat text has many limitations; first of them is it use our brain in not so effective manner. Our brain neuronetwork consists of billions connections between neurons which contains huge amount of information and can make thousands different combinations of it. MindMaps is the simple representative of such neuronetwork so it is very natural to thinking process. I started every project from MindMapping. On the picture above yu can see several real MindMaps I did for several projects. Of course it is the light version, because for my own work I use much more complicated with many branches and interconnections. But a simple MindMap can turn your work much better then pages of text. So try to make something like MindMap for any simple idea or personal experience you have. No needs for special soft; you can do it by handwriting. Just feel the differencies between your unmapped experience and your ideas represent by MindMap. 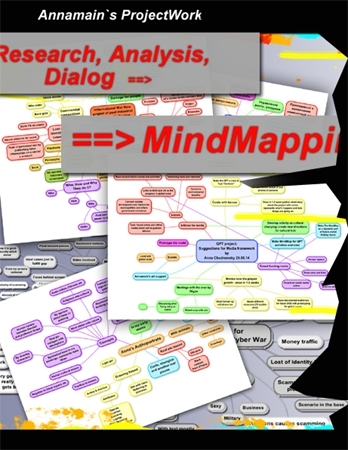 Using MindMaps you can speak with yourself by natural language. I bet sometimes you make a really good looking plan and stuck with it`s beauty. Plans could mesmerise us with feeling of nearly ready project. This is one of the obstacles for people who make plans well and become too much accurate with it. Life can bring more differencies, circumstances can be changed, input conditions and probable result too. Another people could be involved. All of it influences your plans. If we are still at the 1st stage (planing and mapping), just make additional brunches to your MindMap, or do another one, or Mixed maps. This is the easiest changes that`s why all of us desired to know more at the planing stage. However our life isn`t ideal so changes could come at any stage. That`s why this is the second stage of planing I call "Transition Zone". Transition zone is the border between your planing (researchs, understanding) and implementation all of it into real life. What can we do with it? Dialogs helps to make transition well, sometimes it is better to complete all dialogs on the planing stage so it is different approachs. Different cases, different actions. The same is your own mind ability to convert such abstract things as planing and mapping into real deeds. Such border is challenging. Many people stuck with it. Sometimes the MindMap is too much abstract so it seems as a huge gap between it and real life. So we should make some training to teach our mind how to transit the ideas into real life smoothly. It can be trained in different manner appropriate to individual mind structures. I do it in my private coach practice. Also I make public several methods I use for myself, such as Drawings annamain.org/site/comments/creation_and_thinking_fire_style_water_style/. Anyway, we train our mind to gum our Ideal Idea with real world conditions and make new product. Sometimes the Transition itself is the product, for example I train people how to make it. You can try to train it by yourself because our mind has such algorithms naturally. Just it needs to develop the feeling of Transition Zone and feel it differently until the process becames smooth and easy. The result of your MindMapping and Transition should be real, skillful and flexible to be implemented in open systems. As we live in complicated world with so much challenges we should be ready to make different approachs to develop our product in different styles. We are going to live in post-industrial world that`s why ideas has the first position. So it should be creative. As you can see, even serious businesses meet the nesessity to be more creative. CEO of big companies confess creativity as a part of strategic thinking. That`s why creativity should be the part of your future product, or implementation or your ideas. It can be in different forms. This is two ways in modern world: one - to be a narrow specialist and work persistantly in that field, second is to be interdisciplinary. Having different education, skills and personal abilities (from technical to arts) I am multidimensional interdisciplinary specialist. So I can produce the result in different forms: writing, coaching, project work, arts etc. 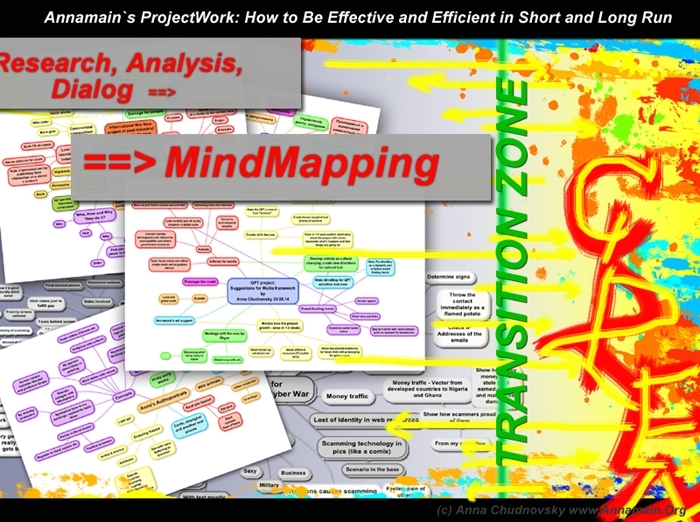 Actually while I am making a MindMap, my Transition Zone works and make mutli-dimentional result ready to translate into different "languages" (visual, text, actions). It makes me to feel how Uiverse turns around. That`s why I suggest you to try more then you usually do. So the Third stage of a project is Creative Implementation in choosen or different forms. All above fits Adizes Methodology in term "Flexibility under control". You are free to be creative inside plans to fulfill your project well and keep timing. You are restricted by resourses in natural way so it is normal to think in terms of limitation. As I like information in different kinds, I did that Infographics to you. It represents how such processes develop. You can see yellow arrows links left and right sides of the picture. It represents the brain, social and informational processes which links two parts of project work continuously. That`s natural for our brain so it is good to have some training, may be self observation to catch how it goes on. Sometimes people think they don`t do MindMaps and have zero in that field. However our mind is acting that way. If we have no access to own brainwork so have no chance to manage it. It remains us effective in short run, in operetional decisions, but we have to rethink more if situation changes. It costs time and energy, sometimes too much. Having the whole process in our hands we can act more effective and efficient in short and long run. That`s why small training can help a lot. You can perform it right now, after you`ve finished the post, with fresh feelings. Just try it, just do it!